EAB-infested ash trees can include thinning and dying crowns, water sprouts along the trunk and main branches, increased woodpecker activity that causes the tree to look like it is losing patches of bark, S-shaped galleries on the inside of bark, vertical bark splits, and 1/8-inch D-shaped exit holes where adult beetles emerged from the trees. The larval stage feeds beneath the bark and disrupts the movement of water and nutrient within the tree. Once infested, ash trees continue to decline and usually die within 2-4 years. To learn more about EAB and to view known locations in Iowa, please visit http://www.iowatreepests.com. 1. What is the emerald ash borer? It is a very small, shiny green beetle (½ inch long x ⅛ inch wide; about the size of Mr. Lincoln’s image on a penny). 2. What does EAB eat? Hosts are species (and cultivars) of ash in the genus Fraxinus. Hosts include green ash (e.g., ‘Marshall Seedless’, ‘Patmore’, and ‘Summit’), white ash (e.g., Autumn Purple®) black ash, blue ash, and pumpkin ash. Manchurian and Chinese ash trees are primary hosts in its homeland [Eurasia]. A new host record of white fringetree (Chionanthus virginicus) was discovered in Ohio; this is not a common plant in Iowa. Mountain ashes (Sorbus species) are NOT hosts. 3. Where is EAB from? This beetle is native to Asia and is found in China and Korea. It also has been reported in Japan, Mongolia, the Russian Far East, and Taiwan. EAB arrived in the United States sometime before 2002 in wood packing materials. It has been recorded feeding on F. chinensis and F. mandshurica as a native borer. 4. How did it get to Iowa? Most EAB infestations in the United States have been started by people unknowingly moving infested firewood, nursery plants, or sawmill logs. The adult beetle also can fly short distances (2 to 5 miles). 5. Should I be concerned about EAB? Yes. It kills ash trees, usually in 2-4 years. In the Midwest, millions of ash trees have been killed by EAB since 2002. There are about 3.1 million urban ash trees and an estimated 52 million ash trees in forests in the state of Iowa. Statewide, Iowa averages 16- 17% ash on city property, though the ash component in tree inventories can reach 87%. 9. Who should be thinking about treating ash trees? If you are a homeowner within 15 miles of a known infested area, you can consider treatment of a healthy ash tree during the growing season (see #10 below). If you are not in a known infested area, treatment may be premature. b. Ash trees can be protected with insecticide applied by a commercial pesticide applicator or the homeowner. Trees must be healthy, vigorously growing, and valuable to your landscape. c. Most of the systemic insecticide treatments (i.e., imidacloprid and dinotefuran) must be done each year for the life of the tree. Two active ingredients will last for 2 years in a light EAB infestation: emamectin benzoate and azadirachtin. In heavy EAB infestations, only emamectin benzoate is effective for 2 years; azadirachtin must be injected every year. d. Keep in mind that treatment may not be effective for a given tree due to past injuries, age of the tree, soil moisture, soil compaction, and other site and environmental factors. crown might be saved for a few years, but the tree’s crown will be misshaped as a result of removing the dead branches. f. Ash trees within 15 miles of a confirmed EAB site are at risk of EAB attack. Preventive treatments are suggested within this risk zone, but may be premature outside this area. 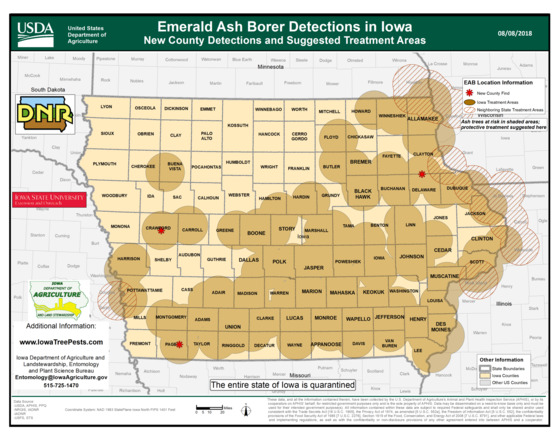 Continued monitoring of ash trees outside the risk zone for EAB symptoms is suggested. g. Systemic insecticides require time, good soil moisture, and active tree growth for distribution in the ash tree. Most soil-applied products (soil drench, granular, soil injection) must be applied in early spring (mid-April to mid-May) to be effective. Basal trunk sprays [most effective for trees <23”dbh] using dinotefuran can be applied from mid-May through mid-June. Trunk injections can generally be made during full canopy (April through August). Good soil moisture is critical for the effectiveness of any preventive treatment. h. Soil drench homeowner treatments are effective for ash trees up to 60 inches in circumference (20 inches diameter), while granular treatments are recommended for trees up to 36 inches in circumference (12 inches diameter). Homeowners can make only one application per year. Trees larger than 60 inches in circumference (20 inch diameter) will need to be treated by a certified commercial pesticide applicator. j. There is a per acre use limitation for soil treatments and basal bark treatments; consult the product label when planning applications. There is no per acre use limitation for trunk injections. k. ISU Extension and Outreach does NOT recommend canopy sprays because of limited effectiveness, the need for specialized equipment, spray drift, and possible adverse effects to nontarget organisms. 11. If I am contacted by a pesticide applicator to treat ash trees for EAB in the fall or winter, what course should I take? The best time for most preventive applications for EAB is spring; some products can be used throughout the summer and early fall (before leaf color starts to change). IF you live within 15 miles of a confirmed EAB infested site, get an estimate for the treatment. It is best to get at least one additional estimate before any work is done. IF you live outside the risk zone, thank the applicator for showing interest and keep the company information on file. 14. What does an EAB quarantine mean? A quarantine by state and U.S. agriculture departments means that hardwood firewood, ash logs, and wood chips cannot be moved out of the area without a permit. Homeowners must not remove their ash tree or firewood from their tree to an area outside the quarantine. Tree removal companies must not haul logs or firewood outside the quarantine area unless inspected and treated as required by the regulations. 15. How many counties in Iowa have been quarantined? The entire state (99 counties) of Iowa has been quarantined for EAB. 16. What should a homeowner or tree care company do with ash trees cut down in or near the infested area? We request that you dispose or use the wood within your county. 17. Can I use the mulch produced by chipping an EAB infested tree for landscaping? If the chip size is 1 inch x 1 inch or smaller (in two dimensions), recent research has shown that EAB does not survive and the chips can be used without concern. If the chip size is larger, however, it is best to bury or burn these chips (according to local ordinance) as soon as practical to prevent spreading EAB into new areas. 18. Can I use the wood from an EAB infested ash as firewood? Yes, with one qualification. Once the ash tree is cut into pieces, the pieces can be used as firewood on your property. Please do not take infested firewood with you on camping trips, tailgating, hunting, or other places because you will spread EAB. 19. What can my ash tree be used for, besides firewood? Depending on the straightness of the trunk and main branches, ash killed by EAB can be processed for lumber or can be debarked and used for outdoor furniture or landscaping. Pieces of scrap wood with the bark still attached should be burned, buried, or chipped. 20. What general recommendations are available to communities? The Iowa Department of Natural Resources has worked with several communities to deal with EAB infestations. Contact Tivon Feeley (515-725-8453) or Emma Hanigan (515-249-1732) for more information. If you live in another Iowa county and would like to contact your Extension & Outreach office, visit http://www.extension.iastate.edu/content/county-offices and click on your county; the phone number is in the blue box in the upper right corner of a county’s web page.